Raising a child and trying to maintain a healthy and hearty family relationship is never an easy task. With both parents working outside the home and a child’s needs to tend to, families tend to get drawn in several different directions, making life challenging at best and a daily conflict at worst. When the parents involved are two successful musicians with separate careers and individual efforts, the balancing act is even harder still. 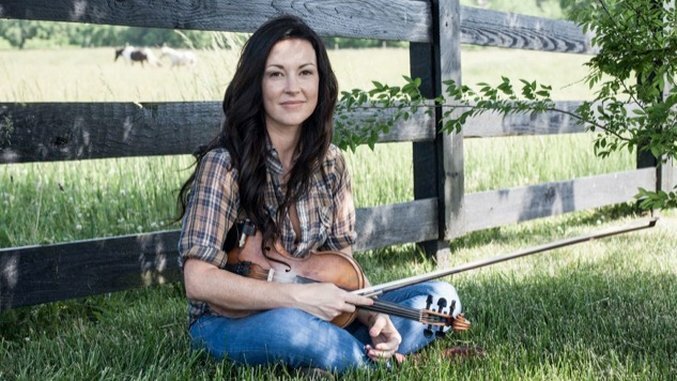 Amanda Shires has been thinking about that a lot lately. She and husband Jason Isbell are raising a baby daughter while keeping pace with careers that find the family separated for months at a time. It’s little wonder then that her striking new album, My Piece of Land, places a heavy focus on themes about home and the hearth. Several of its songs make direct reference—“My Love (The Storm),” “When You’re Gone,” “You Are My Home,” and specifically “Mineral Wells,” named for the little Texas town where she lived as a child. “I was born in Mineral Wells and my dad’s family was from there,” she explains, talking on the phone from her present home in Nashville where she is relaxing on a rare day off. “My mom went to Lubbock because it was pretty much as far as her car would drive her. It was six hours away. The two landscapes are completely different, but if I don’t claim both those places as home, somebody’s going to talk to me on my voicemail about it.” She laughs. Little wonder then that her thoughts brought her back to her own childhood, and the challenges she faced going back and forth between two homes. It was the solace she gained from making music that helped her thrive in what might have been an otherwise difficult time. Nevertheless, it was the need to find a safe place, a place that could be called home, that inspired the songs and gave her a focus on more immediate concerns. Not surprisingly then, that theme gave her a link between her past and present. While Isbell and his band, the 400 Unit, continued to tour, Shires found herself at home, having to cope for the first time with their separation. In between the release of her four solo albums, Shires had played fiddle with the rest of the ensemble. Suddenly she was on her own.